Emotionally charged issues challenge you to determine what you want and how you feel about your choices. Your ethics and values deeply influence your actions, and you may uncover corruption in the process of taking a stand for those values. Take extra care with the quality of your diet now, because you’re more sensitive to unseen or unknown substances. If you’re uncertain about freshness or quality, act on the side of caution. Overindulgence can also be a problem, so sit away from that dessert cart! Sexual intimacy can be a problem, especially if your expectations are aligned with your partner’s. If the contrast between your fantasies and the reality of your love life is too great, explore your level of trust. Perhaps you need to play out some fantasies. If you have reason to distrust your relationship, that will also be apparent, and it’s important to get to the core of any problems before the lunar eclipse on July 28. Joint finances can be sticky, and you may discover that important information has been hidden or kept from you. Probing into the facts is absolutely necessary if you suspect deception or if you’re uncertain about making an agreement. 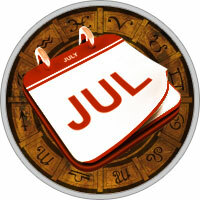 Mercury’s retrograde from July 13 to 31 gives you time to backtrack where necessary. Expect delays in travel or negotiations. Final decisions or signing long-term contracts look better next month. Take a look at your relationships with family, children, and lovers. Where do you need to give more—and when do you need more boundaries?